In South Park: The Fractured But Whole, the character Call Girl can use an attack to sabotage an enemy's phone and deal damage to them. As the sixth-graders, Raisins girls, ninjas, and Crab People of South Park pull out their phones, you hear a voice shout, "PHONE DESTROYERRRR!!" Well, on November 9, that joke becomes reality with the mobile game South Park: Phone Destroyer. 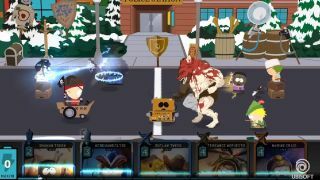 Originally announced at E3 2017, South Park: Phone Destroyer takes the grid-based, RPG-lite combat of Ubisoft's console games and scales it down into an experience meant to be played on your iOS or Android device's touchscreen. You'll collect and upgrade character cards to unlock them in battle, and use these fighters to power through 60 single-player missions or online in multiplayer battles. The game will be free-to-play, but Ubisoft says that there will be no "energy, timers, or other limits on how much you can play". Story-wise, Phone Destroyer starts with the neighborhood children unsure of what to play (I suppose fantasy and superheroes got boring? ), when Cartman suggests playing Cowboys & Indians. But of course, this being a world of talking stoner towels and anthropomorphic pieces of feces, the situation quickly escalates and suddenly there are cyborgs, pirates, gods, and more thrown into the mix. If you pre-register ahead of the game's launch, you'll earn a costume for your New Kid avatar mimicking the ManBearPig costume that former Vice President Al Gore wore in season 10. You know, when he was trying to convince everyone in town that he was super cereal about this imminent threat. Yes, South Park is a little silly sometimes.